In new blogger templates, direct Adsense integration wont work. Adsense code script when run directly from a template won’t give desired ads, instead display blank space. To solve this problem we need to change the html > < into HTML entities. Blogger Ad Code Converter will change the desired entities and that will help you to add adsense codes inside blogger templates. 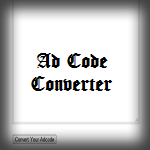 Blogger Ad Code converter work with chitika ads as well as adbrite ads. 1. Create A new adsense using your adsense account. 2. Copy paste new adsense code in to the Blogger Adsense Ad code converter tool and Click Convert your ad code. 3. Now you can copy paste the same code anywhere in your blogger template. If you are using blogger HTML widgets , don’t need to use this tool. This tool will be handy when you need to put ads directly to a custom blogger template.